Ian reports a mild morning at Grosmont yesterday with the odd shower, just after our usual cuppa. 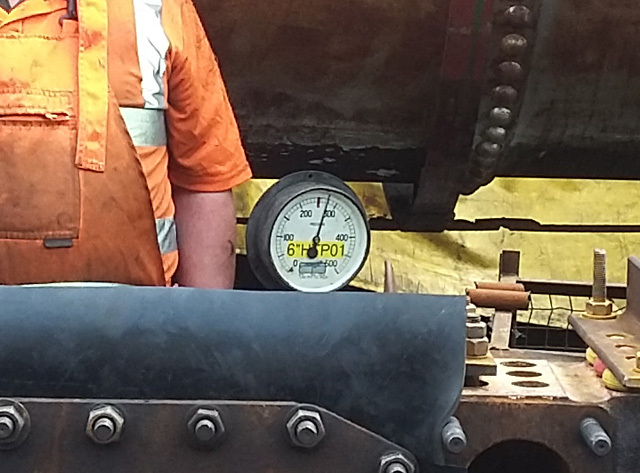 He reckoned though that Bill and his day really started on Thursday morning with a couple of unsuccessful attempts to complete the hydraulic test on the header, with the rubber seal failing behind the cover plate. New, thicker, rubber sheet was obtained from Hopetown works on Thursday afternoon to make a new gasket. On Saturday, with Bill Dobson, Nigel Bill, and Ian at the helm, success at last! Ian and Bill removed the cover plate and the old rubber seals, while Nigel made a new gasket. This was then fitted and secured, the header was filled with water, a doggy ball was fitted, and the top plate screwed down. Bill then pumped up the pressure to 270psi and no leaks! Paul Middleton was on site, so he inspected the header and passed it as OK (see photo of the happy team). By now the sun was shining, so lunch was had alfresco on the picnic tables near Deviation Shed. 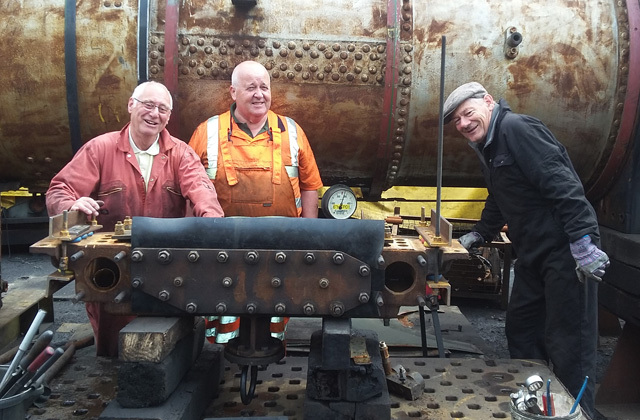 After lunch, Bill wanted to complete a job on the left hand piston travel, so it was Ian and Nigel on pinch bars moving the loco a short distance to remove the little end pin, and identify whether any adjustment was needed to the big end bearing. Bill marked the distance of travel with punch marks on the bottom slide bar with the con rod on back dead centre, and found the big end requires some shims to the right side of the bearing, but this will be done on Wednesday. Not many people round the Shed yesterday, bearing in mind it was a Bank Holiday weekend. The J27 was at the back of No 5 road having a water change. B1 1264 was a spare engine, and was also on No 5 road. Next working party will be on Wednesday 30th May - another month nearly over - although Ian will not be available as he has a driving turn that day.